Share the post "Interview: VINCE CONTARINO (Led Zeppelin Masters)"
Marking fifty years since the release of Led Zeppelin’s self-titled debut album – and its follow-up, ‘Led Zeppelin II’ – Australia’s Stairway To Heaven: Led Zeppelin Masters will return to the UK for ten-dates in April 2019 as part of their European tour. The debut UK tour in 2017 seemed to be well received. How did it feel for the band to be performing in Led Zeppelin’s homeland? It felt a little if not quite considerably surreal. After so many years of playing the music of Led Zeppelin in Australia (since 1986) to actually be invited to play in the UK was literally incredible to us. But it happened! You played the iconic London Palladium on the last tour and on this one you appear at the legendary Hammersmith Apollo. What was it like performing on the Palladium stage? It was only nerve wracking when I thought about it, so I just put it out of my mind until we finished the tour. When I got home I called all my friends to tell them we now do all the gigs The Beatles and Led Zeppelin used to do! Most of my mates just hung up on me after they gave me some explicit advice!! But seriously, it’s an overwhelming experience for us, and regardless how many times we get the opportunity to play these types of gigs they will always be very special. We genuinely feel blessed. Back in Australia the band has been performing at the iconic Sydney Opera House. Is there a healthy rock scene in Australia, and do you get a different crowd reaction from the fans there compared to, say, the UK? I’m a hermit, so I have no idea what the “scene” is like. I hear so many negative things about the lack of live performances and opportunities for artists on social media. However, my personal experience for the last 40 years has been amazing. So, for me, it is healthy and vibrant. I suppose it can always improve, but we should all take the responsibility for that and not blame invisible people. Maybe we can dig the boots into the government because that’s always fun and gratifying. With regard to the differences between audiences in Australia and the UK, yes, there is a difference. The audiences in the UK are more demonstrative and so are the people. I have never been hugged and kissed so much in my life as I was in England…apart from when I visit Italy – haha! Australia is a long, long way away, so we don’t get the amount and diversity of artists that you do in the UK and Europe. With respect to Australian audiences – and remember, I am one – you guys over here are exposed to a greater diversity of art and have a wider appreciation of different forms and things in general. Will there be many changes to the set list, especially as Led Zep’s debut album came out fifty years ago? Well, because it is 50 years of Led Zeppelin we will start the ball rolling with the first song from the first album. You can work that one out. We have changed the set list to be more rock orientated and added Heartbreaker and Dazed And Confused. Has the band ever played, or thought of playing, a Led Zeppelin album in full? I have thought about it, but could never find the right way of presenting it. Not all songs work live, so the setting has to match-up with the ability to deliver an album. Maybe filmed and recorded with a studio audience could be one way of doing that. I’m open to it. 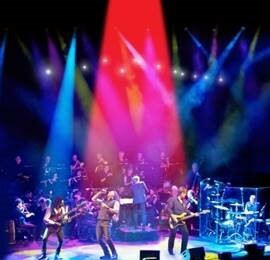 How did the idea for a tribute show with an orchestra come about? Are there any Led Zep songs you’d like to perform but can’t as they don’t lend themselves to the orchestral format? We were touring New Zealand in the early 2000s and we drove through all the terrain where Lord Of The Rings was filmed. This made us think of grandeur and bigger than big. So we approached the Adelaide Symphony Orchestra. They were interested and since 2005 we have been developing this show. 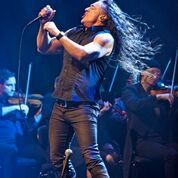 You know, I once thought that some songs just won’t work with an orchestra, like Black Dog, Rock N’ Roll and Immigrant Song – boy was I wrong!!! So I think they will all work depending on the skill of the arranger to appropriate the correct notes to the right instruments. Will it always be Led Zep songs or could there be a time when Led Zeppelin Masters play say some Plant & Page songs? Which songs do you look forward to singing the most and why? I get asked this often. For me, it changes all the time. I don’t know why but it does. Lately, Dazed And Confused and No Quarter are just a delight to sing and perform. 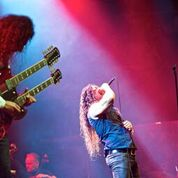 Some Led Zep fans may dismiss a tribute band. What would you say to those to encourage them to come along and give the band a chance? I don’t blame them. There are so many tribute and cover bands that were born out of opportunistic paradigms. We started this whole thing 33 years ago as a bit of fun. Because Led Zeppelin said they would never perform again we thought we would give it ago in Adelaide, where no-one would ever notice anyway. What that means is we always had the music at heart, and the integrity of the compositions to us is everything. Not the clothes, not the wigs, not the impersonation, just the music. So if you want hear the music you love played live then come and see us, because we love it too and all this stuff that has happened around us is because people wanted it in the first place. Well, I’m not going to call them our fans, but I will call them Led Zeppelin fans. You have to come to see and hear this show. It will fill you with pride and joy. Bring your kids and let them hear the music you grew up with and see what they say. This entry was posted in All Posts, INTERVIEWS, Interviews/Rock Stars and tagged Black Dog Orchestra, Classic Albums, classic rock, gigs, interview, Jimmy Page, Led Zeppelin Masters, Robert Plant, rock, Tour, Vince Contarino. Bookmark the permalink.